Read two critical perspectives on Norte: The End of History (2013, Lav Diaz) , from Richard Bolisay and Francis “Oggs” Cruz. 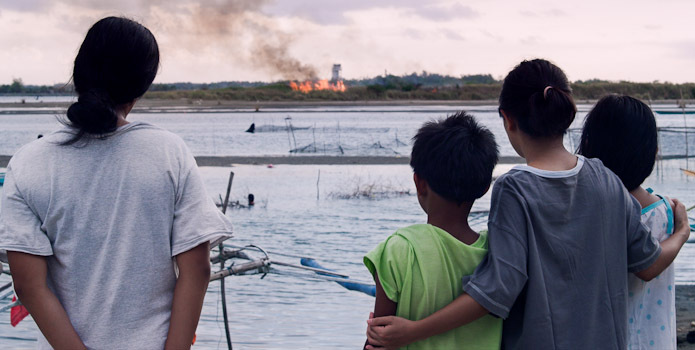 Norte opens in San Francisco at the Yerba Buena Center for the Arts as a special sidebar engagement in conjunction with YBCA’s New Filipino Cinema series. Since his earliest films, Lav Diaz has demonstrated an ability to inflict wounds that feel painful only after they heal, and in his lengthier movies this fixation has grown bleaker and more threatening, for between the projected image and the audience a bridge is being built for the burden to cross. The length of his movies has always been a source of discouragement, but experiencing the passage of time is crucial in looking into his work, especially with how change erodes the lives of his characters. The concepts that Diaz is so keen on exploring film after film hardly feel abstract or theoretical: they are made specific by his anger and frustration, by the seeming futility of struggle, and by the aggression inculcated in small and large systems, begun and exacerbated during colonial rule, and present even now on various levels of society, continuing to oppress and eliminate the weak and the poor, to whom Diaz has frequently dedicated his stories. Diaz has always been on the periphery of the industry, and this position—away from the rewards and restrictions of popular digital cinema, the development of which has given way to a much-desired golden age—has made his films even more distant from the public. Yet with the searing clarity of its vision and the measure of significance that lies in its fullness, Norte: The End of History is likely to be continually referenced as proof of his brilliance. Norte has come at a time when the current political climate is beset with prospects of having another Marcos as president and the alarming emergence of young minds defending his dictatorial regime. In interviews, Diaz has affirmed that his character Fabian (Sid Lucero) has been molded from Ferdinand Marcos—the brightest law student in his class, the young murderer dodging his punishment, the intellectual wrestling with his demons, the man gifted with good looks, wealth, and freedom but struggling for peace of mind and contentment, the leader enlivened by his keenness to destroy—and Diaz has made a point to set Norte in Marcos’s hometown in Ilocos, the land where the roots of despotism are anchored into the present, lending the film not only its title but also its past. In almost every review of Norte there seems to be a fulsome need to mention Diaz’s admiration for Fyodor Dostoevsky’s Crime and Punishment , the parallelism and differences between Raskolnikov and Fabian, the hopelessness of their tormented existence and the context in which their actions (and inactions) produce harsh consequences. While this is clearly a remarkable way of examining his work, unfortunately it also limits the perspective appropriate for a much more illuminating appreciation of his position as a filmmaker from the third world, as a narrator of his countrymen’s inexhaustible suffering, and as a Filipino who tries to alleviate the centuries-old struggle for equal opportunity by keeping its memories alive. Extrapolating Dostoevsky’s influence on his films creates an attractive distraction, one that asserts Diaz’s accessibility because of the themes he engages in, but it does not exactly offer the most persuasive reason for his importance. 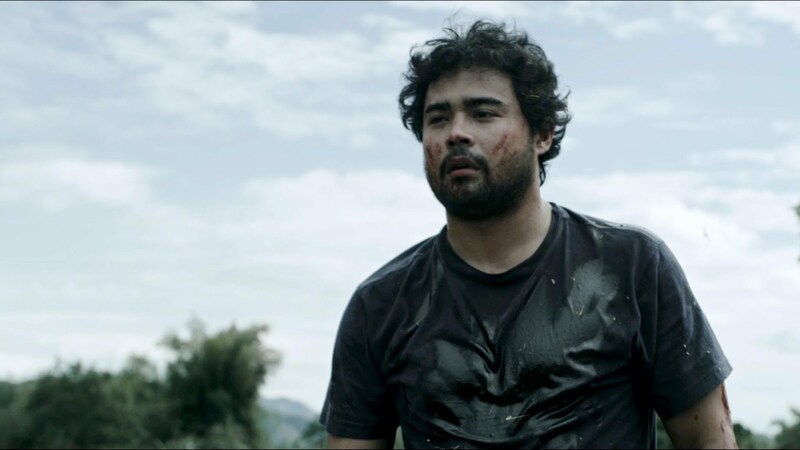 The patriotism that permeates in his films has always been exact and uncompromising—the identity of the characters is unmistakably Filipino, made more distinct by their ambiguities and contradictions—and in this regard, it is only rational to suggest that the artists with whom Diaz can be comfortably associated are his fellow writers with strong roots in social realism, specifically Rogelio Sicat and Edgardo Reyes, authors whose short stories, novels, and essays confront the elaborate cycle of violence experienced by the poor and their great efforts to contend with this terrible reality. It’s unfair that there’s only so much a writer can talk about in the presence of great art, but the inability to express and explain every aspect of its finery simply confirms its worth. Every attempt to assess Norte reflects the failure to cover countless areas of discussion it cracks open. The film’s title, in what seems to be Diaz’s harshest assertion, does not refer only to a province but also to a direction, the cardinal point of a compass, the traveler’s guide to reaching a destination, and the force that pulls a person to a grand purpose. What Norte ascertains is that all debates on the current state of Philippine cinema must end: Norte answers everything. And sadly it is enough. This review is excerpted from a lengthier write-up, which can be found at Richard Bolisay’s cinema blog Lilok Pelikula. History is often written to objectify the past into a series of related events that lead to the present. As a result, it tends to glorify milestones to the point of neglecting the humanity that is the soul of such a continuing story. The history that most of us acknowledge is nothing more than a collage of important dates, people, and places that shallowly define nations, ultimately trivializing them. History, however, is also a malleable thing. It can be shaped to favor interests and ideologies. The history that is taught in school textbooks has been molded to precisely define the Filipino nation as a product of anti-colonialist struggles intended to protect democracy. It instills both pride and a distinguishable identity to the ordinary Filipino. Any Filipino who has a respectable memory of this institutionalized history will see his Filipino citizenry as both a gift and a responsibility. In Lav Diaz’s Norte: The End of History , Fabian (Sid Lucero) personifies someone entrenched in institutionalized history. He is, in fact, an expert of the institution, garnering respect and awe from both friends and mentors for his mastery and criticism of the establishment. A once promising law student who dropped out of school presumably out of disillusionment, he maintains a modest lifestyle edging into debt. Intelligent to the point of madness, he favors anarchism to the current state of order. Fabian has a point. The laws he has dedicated years studying protect evil people, specifically his shrewd and avaricious creditor, to whom he is becoming increasingly indebted. Enraged, he commits a crime that incriminates an innocent man. Dostoevsky’s Crime and Punishment immediately comes to mind. The similarities between Diaz’s film and the famous Russian novel are uncanny, but it is where the two works separate that makes Norte special. Unlike Dostoevsky—who concentrates on examining the criminal—Diaz shares the focus with Joaquin (Archie Alemania), the man framed by Fabian’s crime, and Joaquin’s beleaguered wife Eliza (Angeli Bayani). By covering their side of the story, Norte exposes them as victims of oppressive marginalization and systemic corruption, both which plague Philippine society. Hope can only cause more misery for Joaquin, Eliza, and their class. Clearly, Fabian is the more fascinating character. Consumed by guilt, his convictions betrayed, he courts despair, aimlessly searching for redemption from institutions that represent everything he abhors. His chosen path to redemption, however, is marked by repulsive self-preservation, even as—in a moment of conscience—he tries to facilitate legal remedy for Joaquin’s unjust incarceration without confessing to his crime, thereby exemplifying the selfsame shallow concern the ruling class has for the marginalized it has exploited for years. Diaz posits a society where evil is bred through situations of easy opportunism. The north of the film’s title refers to the rich province made famous by capitalist clans and political dynasties that perpetuate a culture of social stagnancy in the region. It is therefore unsurprising that many critics read Fabian’s intellectually flawed character as an allusion to dictator Ferdinand Marcos, who—despite national derision during the decades after his downfall—is still treated as a hero and a treasure in his northern hometown. Yet Fabian is nowhere as brilliant or as ruthless as Marcos, nor his crime as grave. Marcos ensured his protracted reign by silencing and eliminating opposition. Fabian is more of a by-product of Marcos’ legacy: the disillusioned child of a regime that broke its promise of renewed democracy. Interestingly, Norte equates the fate of both men who, though separated by education and social class, share a similar broken destiny. This is the apocalypse Diaz has envisioned for the Philippines: a country where the basic units of society have been bastardized and torn apart. According to English novelist George Orwell, “the most effective way to destroy people is to deny and obliterate their own understanding of their history.” Within Norte ‘s four-hour running time, Diaz maps the disparate but connected lives of people struggling in a society that has been skewed by a history plagued with ill motivations and half-truths. This review is excerpted from a lengthier write-up, which can be found at Francis “Oggs” Cruz’s cinema blog Lessons from the School of Inattention. In his essay “Wishful Thinking for Philippine Cinema,” Alexis Tioseco wished that film critics Richard Bolisay and Oggs Cruz “would get space in the broadsheets, because they’re far more interesting than anyone writing there regularly.” EatDrinkFilms is grateful for their permission to repurpose their reviews of Norte for this article. This entry was posted in Films and tagged Critics Corner, film review, Films, New Filipino Cinema, Norte. Bookmark the permalink.